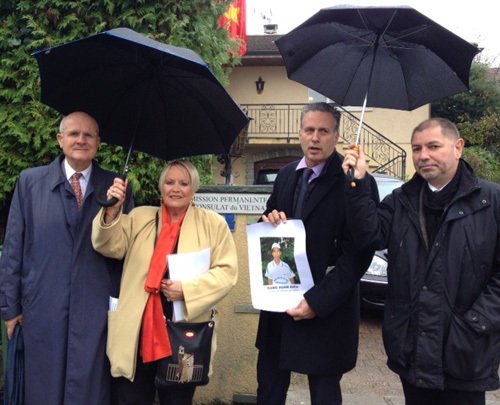 On the morning of November 10, 2014, a delegation of Swiss elected representatives and senators visited the Vietnamese Consulate in Geneva to hand a petition to be sent to Vietnamese Prime Minister Nguyen Tan Dung regarding the inhumane treatment towards prisoner of conscience Dang Xuan Dieu, which has made his health deteriorate. The delegation consisted of Representative of Geneva State Anne-Marie von Arx-Vernon, former Geneva Mayor Michel Rossetti, Grand-Saconnex Mayor Jean-Marc Comte and Pregny-Chambesy counsellor Rolin Wavre. The petition requested for Vietnamese Prime Minister Nguyen Tan Dung to bring attention to the harsh prison conditions faced by Dang Xuan Dieu and asked for the Prime Minister to intervene in order for Dang Xuan Dieu to receive medical examinations and to be treated fairly while in prison. 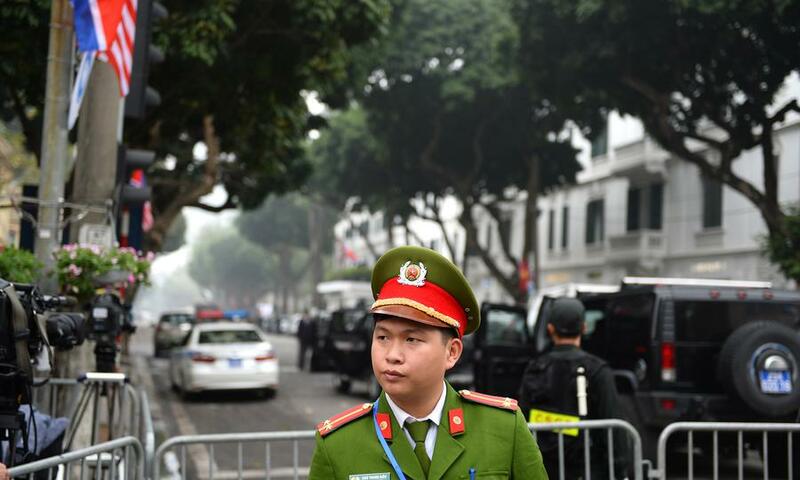 Anne-Marie von Arx Vernon described the case of Dang Xuan Dieu as a humanitarian issue and asked for permission from the Prime Minister for a Swiss delegation to visit Dang Xuan Dieu. 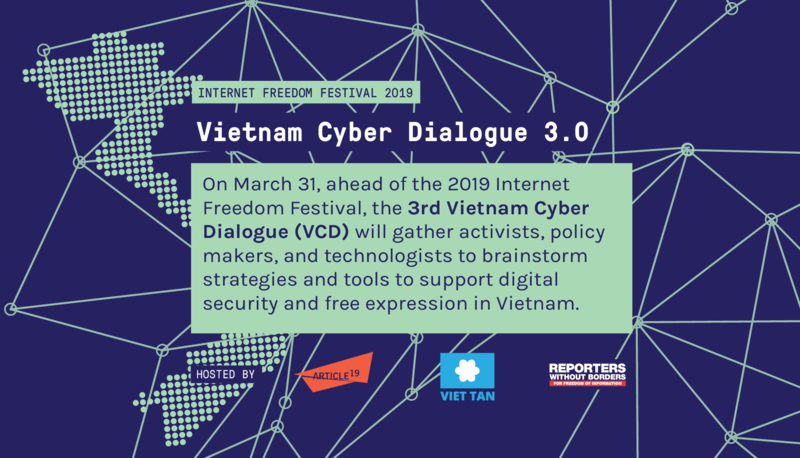 She also requested the Prime Minister to review the case of Dang Xuan Dieu under the International Covenant on Civil and Political Rights, of which Vietnam is a signatory. Anne-Marie von Arx-Vernon mentioned that Vietnamese Consul to Switzerland Do Ha Thao promised to pass the petition onto the Vietnamese Prime Minister. 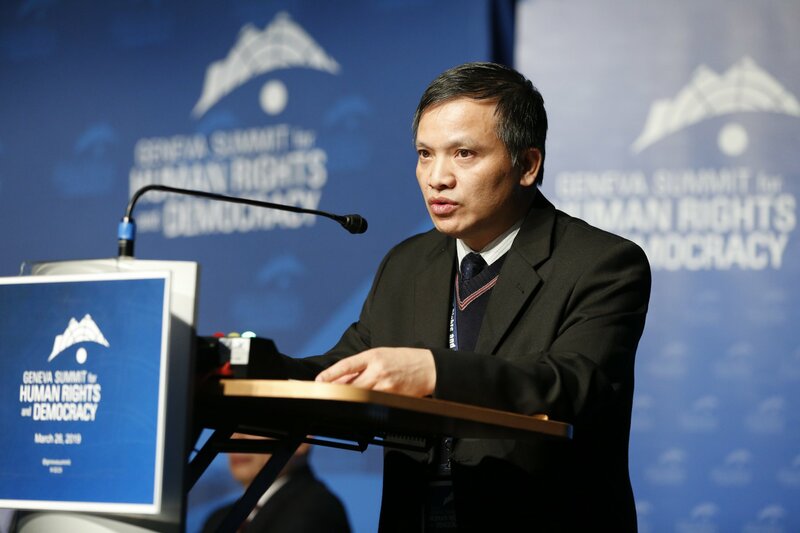 Former Geneva Mayor Michel Rossetti shared that he has always been supporting alongside Vietnamese activists for a democratic Vietnam. Grand-Saconnex Mayor Jean-Marc Comte stated that he was honoured to sign the petition sent to Nguyen Tan Dung and hoped that Dang Xuan DIeu would be released soon by Vietnamese authorities. Senator Rolin Wavre requested the Vietnamese government to respect the several treaties in which it is a signatory to. 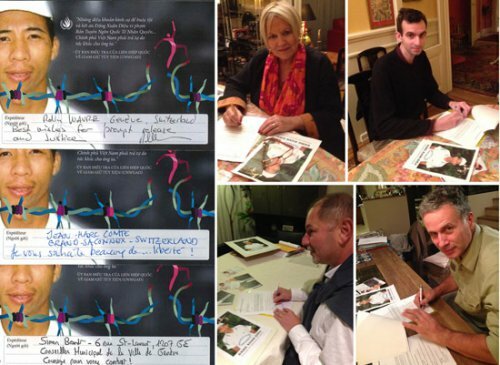 Anne-Marie Von Arx, Simon Brandt, Jean-Marc Comte and Rolin Wavre signing petition and writing postcards for Dang Xuan Dieu. From left to right: Michel Rossetti, Anne-Marie Von Arx, Rolin Wavre and Jean-Marc Comte.